Home Update Center 2. New Features Schedule Blocking Released! 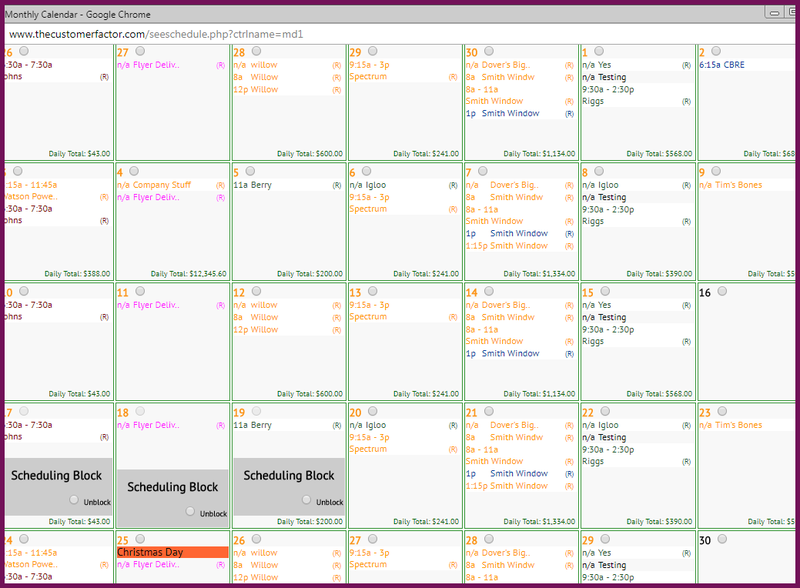 Today in http://www.thecustomerfactor.com we released a schedule blocking feature that will allow you to block entire days or even partial days in order to prevent the scheduling of appointments. That’s all there is to it! It can’t get much easier than this. Just drag and drop and you’re good to go. To unblock a blocked date, do you see the “Unblock” choice that’s available within the actual blocked area? If you decide that you’d like to “open” up any blocked days, click the little circle in front of “Unblock” and the block will immediately be removed. Also if you’re scheduling appointments from anywhere within The Customer Factor you’ll notice that in the small calendar that opens which is where you choose your appt. dates, all blocked dates are grayed out. So it’s impossible to mistakenly schedule an appointment for a date that’s blocked. I’ve spoken to a few users recently who are not aware that there is a duplicate schedule available to review when scheduling. This duplicate schedule will also show you what’s blocked or not similar to how the actual monthly calendar shows you dates that are blocked. When scheduling an appointment all you have to do is click the little circle (radio button) within the date. But for blocked dates you’ll see how the radio buttons can’t be selected (ie: feb 6, 7, 20, 21, 22). If you want to unblock a date so that you can schedule the appointment you’re trying to schedule in that date, just click “Unblock” within the blocked area, the radio button becomes clickable again, and you can then schedule your appointment. As always if you have any questions, please let us know. 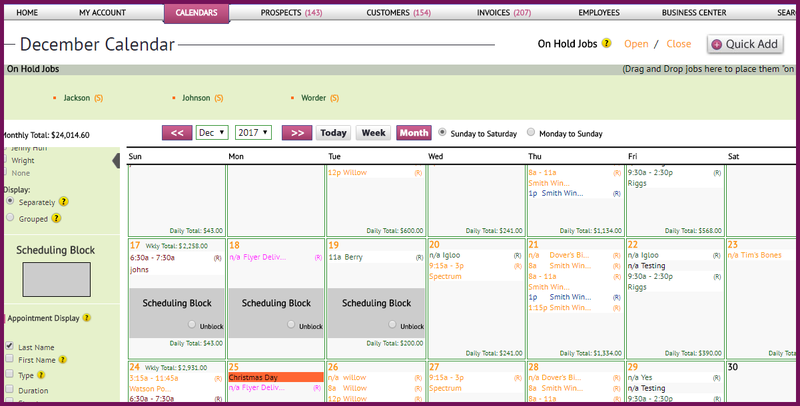 Color Code Employee/Crew Appointments On Your Calendars!